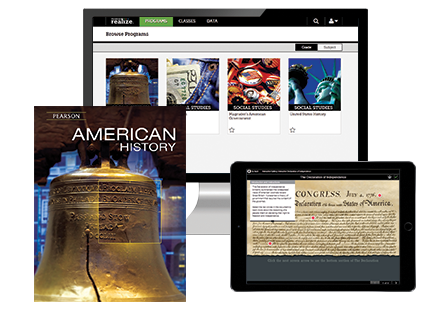 Pearson is excited to announce its NEW American History program for middle grades! The program is designed to unlock the exciting story of our nation’s history with engaging stories, activities, and opportunities for drawing connections from the content to students’ own lives, expanding their understanding of American history and why it remains important today. The program bridges time-tested best practices, curriculum standard expectations, and technology to help prepare students to be college and career ready all while unlocking the exciting story of our nation’s history. The program is available in print, digital, and blended options. Pearson’s middle grades American History program uses a research tested, four-part learning model to enhance teaching and understanding.